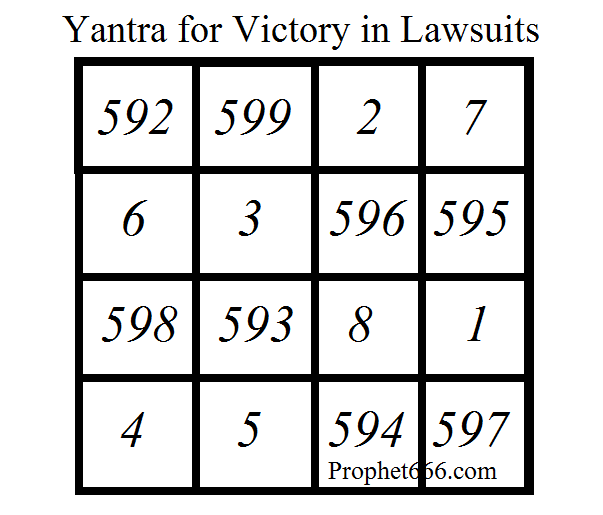 This Yantra, described by me in this post is said to act like a Protective Charm, which specifically ensures victory in any kind of lawsuits. In the past, I have written about some unique Indian Charm, which facilitate success in court cases and other such related legal disputes. Each of these Indian Occult Remedies follow a special procedure and the same is the case with this Yantra, which is detailed below. The Yantra shown in the image should be prepared on Silver during the astrological Yogas of the Guru Pushya Yoga, Ravi Hasta Yoga or the period of the Mula Nakshatra. It can also be prepared on any of the most auspicious period of any of the days of the festival of Diwali. A very important thing to remember is that when the Yantra is being engraved on Silver, the end user should be breathing through the Right Nostril or Surya Swara in the Hindi language. Once prepared, the Yantra should be offered Dhoop/Diva everyday and always kept in the pocket of the user. 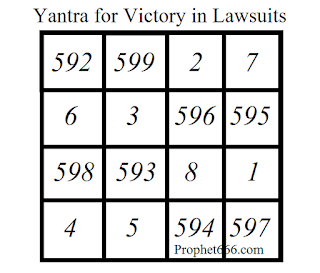 Note- other than the simple steps prescribed in the article, there is no other from or worship or Mantra Chanting required for this Yantra Experiment to win lawsuits. The Yantra is a numerological combination of unique numbers and vibrated to a special frequency and is not dedicated to any Hindu deity. In addition to these remedies, you can search for Mantras and Paranormal Remedies for the same law related problems and obstacles mentioned above. A silver sheet is easy to find, the exact procedure as per the Tantra is given in the article. The Yantra has to be prepared on Silver, it can be done through a goldsmith. friends...if you cant do it with the help of goldsmith, buy a thin silver sheet(it can be obtained from jewellery or from a goldsmith) and write the numbers with a sharp metal piece like a safety pin.